Randy and I finally replaced our "old" digital camera with a new one with much better resolution. To try it out, we went to one of our favorite stomping grounds, Black Sand Beach on the Big Island of Hawaii. 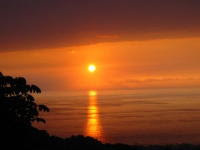 It is just a short drive from the Leilani Bed and Breakfast. It was late in the afternoon and the sun and shadows were really great. So, what do you think? The first two are of the fresh water pond, just behind the beach. And of course for the last picture, I had to shoot one of my wonderful friends, this amazing green sea turtle. I would say I see a turtle about 85% of the time I go to Black Sand Beach. Usually they are resting on the sand, but sometimes you see them nibbling on the algae on the rocks in the shallow water. For, me they are a symbol of wisdom. I often take a break from our B&B here on the south end of the Island of Hawaii and go and visit them. There are plenty of coconut palm trees along the beach for shade to hang out in comfort and watch. Of course you can also see them when you are swimming or snorkeling there. By the way, when you do go there, be sure to take some beach shoes. The black sand can get really hot on a sunny day! Its Micky and Suzy ! Just dropped by to say thanks for such a relaxing experience (as long as we were there)and to let other readers know what a sweet, enjoyable and clean little place you have.